Always on the lookout for new approaches to quilling, Cecelia Louie's work caught my eye... she quills in an engagingly simple manner. I admire the way her coils are more open than is usually seen and also widely spaced, giving her designs a stylish, modern look. With Valentine's Day on the horizon, it's the perfect time to introduce her work as she enjoys incorporating hearts into her card designs. 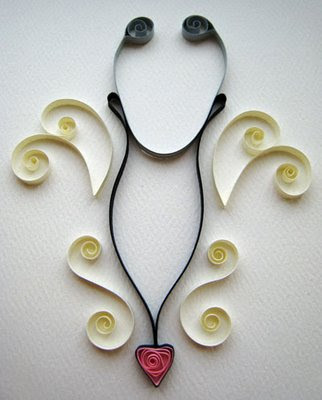 How did you get started quilling? I've been in love with paper since Grade 2, when I first learned about origami. I love to make utilitarian objects, so lots of boxes, envelopes, and cards. I admired the intricacies of quilling books in the library, but the designs and examples were so dated, I wasn't enticed to try. Then I saw the Klutz quilling book [Twirled Paper] and my fingers burned with the itch to play! I loved how lighthearted the examples were, breaking my structurally gridded boundaries that had been ingrained since becoming a graphic designer. I'd go back to the book just to remind myself to let loose and not overthink a piece. 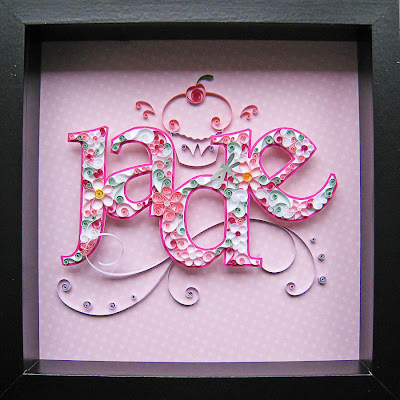 Your quilling style is different than what is typically seen. Yes, I think I've always made my quilling loose because honestly, it fills up a card faster. That doesn't ensure a better design though, because it's more fragile and difficult to tame when gluing down. At first I used the slotted tool that came with the Klutz book and as I improved, used an awl I bought years ago for bookmaking. I still use an awl now as it doesn't make a crimp in the center. Do you have any quilling goals for the new year? Yes, I do. I've repeatedly ogled Yulia Brodskaya's work and recently Raphael Art (courtesy of your blog). I can't find anything wider than 1/8" quilling strips here in British Columbia, and also find the colors to be rather limiting. I'm guessing the paper Yulia and Raphael use is wider and thicker. 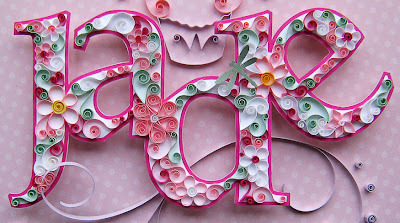 I love the way they combine graphic backgrounds with their quilling, adding a new dimension. My goal is to cut my own paper and quill on top of a background. Tell us about your blogs and shop. I started CraftingCreatures.wordpress.com as a way of recording handmade gifts I gave away. Soon I was joined by girlfriends who also enjoy crafts. We're great inspiration for one another and hopefully for our readers. It's incredible how well the site has taken off! Recently I started CraftingCreatures.blogspot.com which is solely my own work, and I also have an Etsy shop in which I sell a set of patterns of my most popular floral designs. Many thanks for sharing your ideas, Cecelia. I imagine quite a few quillers will soon be trying out your Valentines especially. Thanks for asking me to be featured - I'm so pleased! How lovely! Thank you for the great interview! 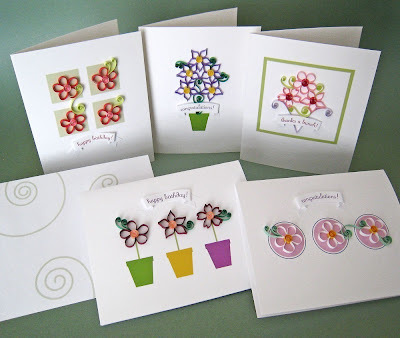 These are so lovely- really inspiring me to try quilling. In general- are the individual coils glued down at a few points? Are there any resources you would recommend for a beginner? Thanks ladies. Meg, your comment makes me realize it's time to write a post with very basic quilling tips. But before I get to that, you might find some information in this beginner's tutorial I wrote for a simple quilled flower. To answer your question about gluing, assemble as much of your design as possible before gluing it on the background matboard, card, or wherever you want it to go. Then spread a thin puddle of glue on a plastic lid or a sheet of waxed paper, use tweezers to hold the quilling, and dip its underside gently in the shallow puddle... place it directly where you want it to go without sliding it around so it doesn't leave a snail trail. Thanks Ann. This is great information about the glueing and I'll certainly check out your tutorial. I would love for you to do some beginner posts! Hi Ann, you have inspired me to try quilling, bought two books about it at amazon. Thank you for being a constant inspiration. Cecelia's work is gorgeous - love the openness of the loops. I never would have thought there were so many styles of quilling. Absolutely love Cecilia's work! It makes me want to take my quilling ota new level! I will have to ty this on some cards as when I quill on a card people really love it. thaks so much for sharing all you tips and the wonderful people you featre as well as you own beautiful work!! That piece of work for jade is absolutely stunning! Holy cow. Fascinating interview and examples - I'm really impressed! I'll definitely be following this blog from now on. Thanks for sharing. You're a quilling expert indeed! Your color sense and your cards are simply awesome! Gosh everyone seems to be quilling now. I love to look at these pictures, such talented artists all of them. I found another great Russian quiller at http://www.papergraphic.co.uk - love her work too.